Show Us Your Tips: Google's "Search don't Sort"
One of the most difficult concept to get across to my computer students is Google's "search don't sort" philosophy, and what it means for us as Google users. But there is a good reason why this is so. The majority of my students have completed their working life. They have been continually admonished whilst working to "get organised", make sure everything is in order; create hierarchies, file documents, create organisational notes, and thus make it easy for those who follow to view our work. Its no wonder we think and organise in our private lives, in the manner to which we are accustomed. So here we are wanting to update our computer skills, and Google tells us to "search, and not sort". They're not really supporting us to organise our Gmail in the "normal" way. How do I find (my archived email?). The answer lies in understanding Google's philosophy of "search don't sort". If we look carefully, we will always find a Search-box inside all of Google's products. Here are some examples. 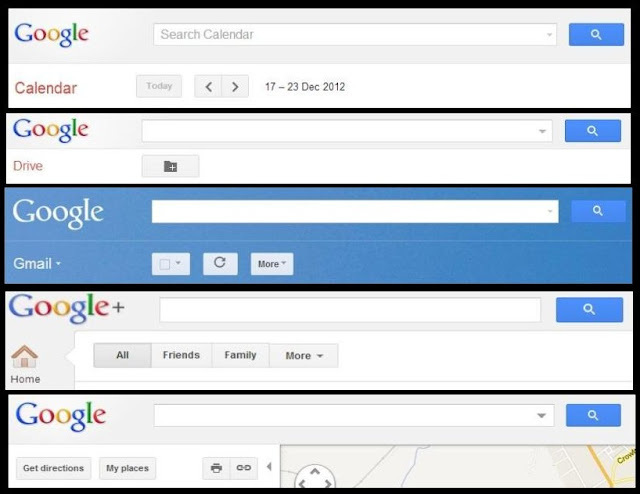 Search Box for Calendar, Drive, Gmail, Google+ and Maps. You will notice one consistent feature of these search boxes: they are all placed prominently at the top and centre of each service. With good reason. To encourage us to use the search function whenever we are seeking information, whether it be from the archive or from the internet. Searching in one product searches across several products. To find whatever we seek, we only need recall a single word that occurred in the Gmail, document, map or whatever. 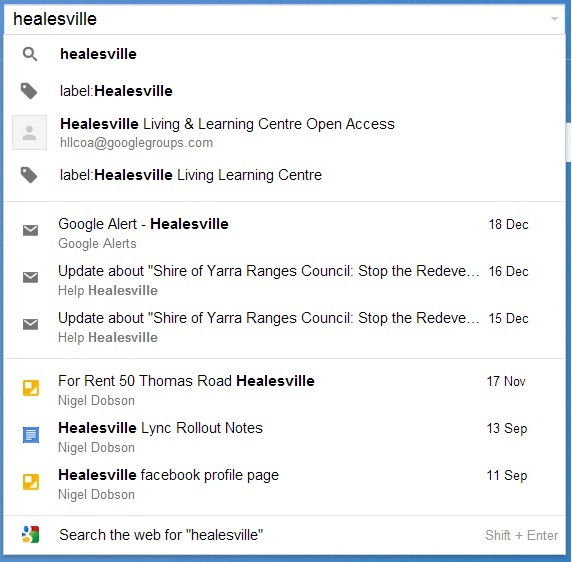 For example, we can search for "Healesville" whilst inside our Gmail. and another Label both of which have the key word in it. 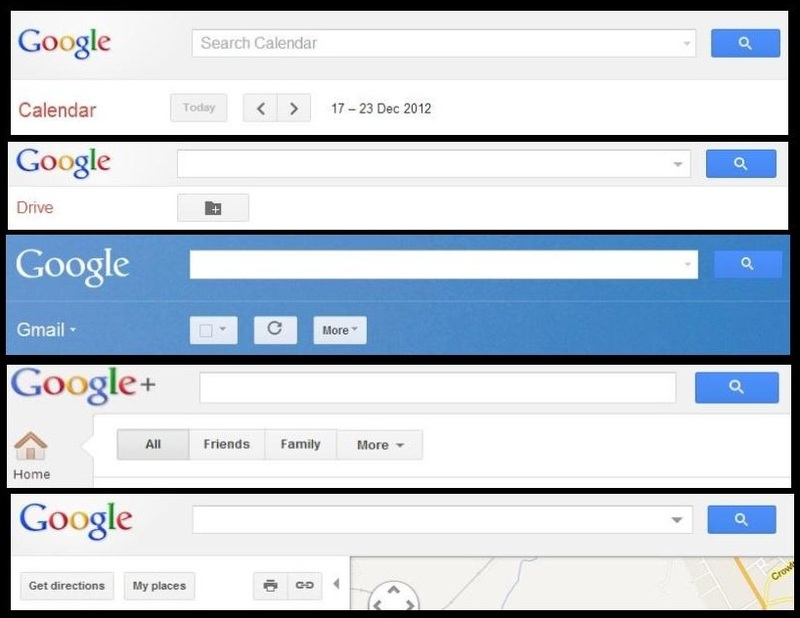 The centre third indicates Google has found the key word in three emails ranging between 15th and 18th December. The bottom third details documents I've created or uploaded which include the key word (Healesville), spanning between 11th September and 17th November. The final line is an offer. Google is offering to search the web for the Healesville key word, if you cant see the information your looking for summarised. Those are the basics. Once we get the hang of searching and not sorting, we find ourselves dancing quickly between the various Google products, led along by our searches until we find the information were looking for. So give it a try. Your welcome Marion. Happy New Year.